A year or so ago, my wife and I drove along the Ocoee River, just across the Georgia line in Tennessee. We were surprised to see how low the water was up there, remembering the attention the Ocoee River rapids got during the 1996 Olympic Games. Here, in late November, we found only bare rocks where we expected churning waters. Later, we learned that water is released intermittently on schedules from the three Ocoee Dams, for recreational and power-generating purposes. The name Ocoee comes from the Cherokee “U-wa-go-hi,” which translates to “apricot place.” Now, let’s be sure we are not talking about the peach-like fruit that grows on trees and, in dried form, often gets incorporated into trail snack mixes. 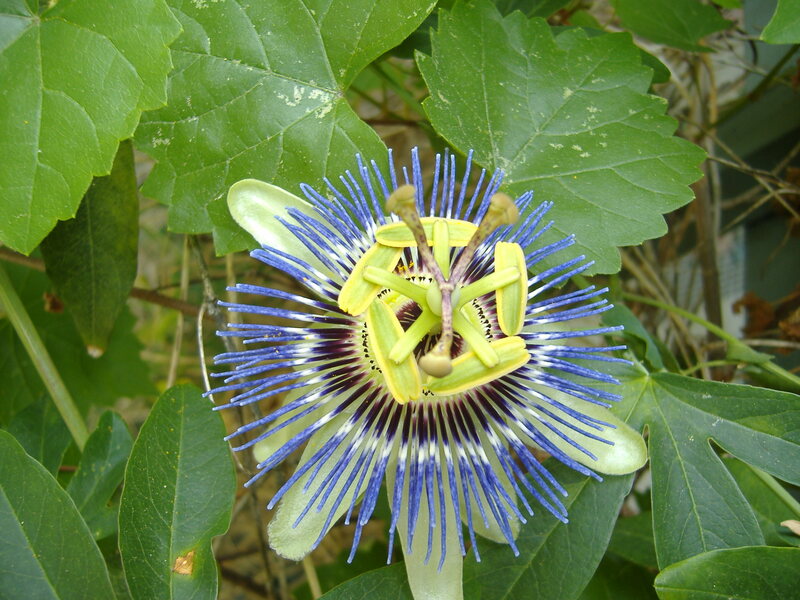 For most of us who grew up in these mountains of Georgia and Tennessee and North Carolina, an “old field apricot” is what the botanists call Passiflora incarnata, the native wild passion flower vine that grows in abandoned fields and along the roadsides. After its lemon-sized fruit begins to yellow and wrinkle just a bit, the thin skin is easily opened so that the delicious fruit can be eaten on the spot or made into a drink, in old Indian style. The leaves and other parts can be made into an effective sedative tea, too.Its Cherokee name is “u-wa-ga,” and some people call it a “Maypop” in English. I’ve noticed that the apricot vines are getting scarce these days–fields don’t get abandoned; they turn into subdivisions. And, the roadside plants get mowed away before the fruits mature. I have planted some on my own property; given a chance, they grow well. Ocoee does not mean “people of the river,” which appears in some publications. Ducktown, Tennessee, a few miles to the east of the Ocoee, lies in the same area as the old town of Gawonvyi [Kawonunyi or Kawanunyi], and “Duck Town” is a pretty good translation of the Cherokee name. “Kawona” is the word for duck, and we see the locative –yi again. Now, if an Indian man were called “Ta-li-tsu-sga,” “two heads,” it did not mean he was a freak of nature; rather, the name might have been given because he had collected or owned two severed heads, presumably of his enemies. Anyway, there was a Cherokee chief Talitsusga who lived just about two hundred years ago. The English translation of his name, as in Doublehead Gap, really does sound better than “Two Heads,” doesn’t it? Doublehead was an interesting and enterprising fellow who was killed by his enemies among the Cherokee. We don’t have space here, but you can find more details of his life in this Wikipedia article. Since we are mentioning “heads,” we can notice that “Brown Head” (Wo-di-ge a-sgo-li) is the Cherokee name for the copperhead snake. A few miles north of Blue Ridge, Georgia, Fightingtown Creek arises and snakes its way through the woods to the Ocoee River just above McCaysville. The creek’s English name came from an incomplete translation of the name of a Cherokee town near its banks. Let’s trace it, with some meanderings. The word “wa-lo-si” (usually pronounced “wa-lawsh”) meant “frog.” Not a bullfrog or a toad, but quite specifically the green frog that my herpetologist friends would call Rana clamitans melanota. One of the best photos I have seen of that frog can be found at this link. 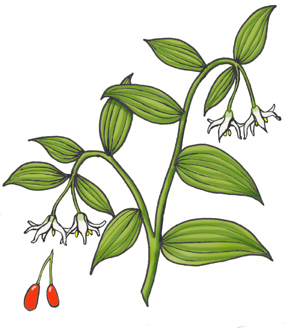 In our North Georgia mountains grows a little plant of the lily family known commonly as the yellow mandarin; botanists call it Disporum lanuginosum, and it reminds one of a very downy Solomon’s seal. I think its red berries are likely to be poisonous. There is an ancient Cherokee story about a couple of green frogs who got into a fight using the flimsy stalks of the plant as weapons, so the old-time Cherokee called the plant “wa-lo-si u-nu-li-sdi” which means “frogs use it to fight with.” Near a big patch of these plants was the Indian town “Wa-lo-si-u-ni-li-sdi-yi” (“Place where the frogs-fight-with-it plants grow”). The name of the town, as often happened, became the name of the creek, but, untranslated, it proved too much of a mouthful for English speakers. To keep things simple, they just translated it as Fightingtown, choosing to ignore most of the story. And that was that. But, the same frog appears again in the name of another old Cherokee town, “Wa-lo-si-yi,” “Frog Place,” which became Frogtown in English. There’s a beautiful little Frogtown Valley up near Neels Gap, and not too far to the south, down in Lumpkin County [GA], Frogtown Creek flows into the Chestatee River. Up in the Smokies, Mt. LeConte is still known as its ancient name, Walasiyi, by some people. Another plant was known to the Cherokee as “ga-tv-la-ti.” It was a rather important plant, with fibers finer and stronger than flax, which could be spun and woven into cloth or carrying bags or fishing lines and more. Textiles made of it have been found in 3000-year-old mounds in Ohio and elsewhere. It had many medicinal uses, including as a contraceptive that may have actually worked and–after the white man brought the disease among them–a reputed cure for syphilis. To treat the latter, one chewed the fresh roots and swallowed only the juice. Now we know, too, that the plant does indeed have some potent effects on the heart and circulatory system. Botanists call it Apocynum cannabinum. The Europeans had long used hemp fibers for cordage and textiles. Yes, that’s hemp, Cannabis; it was much later that it became a “smoke.” Recently there has been a great increase in the legal use of hemp fibers for cloth, and one can buy sweaters and such made thereof. Similar fibers are linen (from flax) and ramie from southeastern Asia. The white pioneers began to use the gatvlati plant, too; they learned about it from the Indians, so they called it “Indian hemp.” There was an Indian town on the creek not too far from where Morganton now stands. To the Cherokee, it was “Ga-tv-la-ti-yi,” “wild hemp place.” The white people translated it as Hemptown, and so we have Hemptown Creek and several other places that incorporate the word Hemp, for Indian hemp; that includes Hemp Top, a mountain rising to about 3550 feet some miles north of Hemptown Creek. HIAWASSEE: It’s Hiawassee for the town, but it’s spelled Hiwassee for the river and the ridge south of Brasstown Bald. From “a-yu-wa-si,” “a meadow or grassy place.” (We’ll mention the linguistic story of Brasstown later; as we are seeing, many place names that are seemingly straightforward English have a Cherokee ancestry, too.) The most prevalent local pronunciation is often “High Wassie,” which brings up an interesting sidelight. Not long ago, I drove near a small community called Low Wassie, in Oregon County, Missouri; that is what the sign said. It may be pure speculation, because I do not know how the community got its name [yet], but I can imagine a person from the Hiwassee River area who was obliged to move to Missouri and chose to create a small and amusing reminder of his former home. Who knows? When I find out, I will update this entry. YAHOOLA CREEK: near Dahlonega. I am convinced that it comes ultimately from the Cherokee “ya-hu-la” (or “ya-hu-li”), a kind of hickory tree; however, the creek takes its name specifically from the legend of a Cherokee trader bearing the name Yahula, who was taken away by the spirit people. The same Cherokee word also means “doodlebug,” the larva which digs those little conical craters in dusty soil, trapping and then devouring ants and other hapless small critters. The adult form of the ant lion, as it is commonly known, looks like a dragonfly. Some people have suggested that Yahoola may come from the Creek “yo-ho-lo,” the black emetic tea made from yaupon holly (Ilex vomitoria); that plant is itself an interesting story, but I doubt that it gave its name, even indirectly, to Yahoola Creek. The creek joins the Chestatee River just south of Dahlonega. CHESTATEE: From “a-tsv-sta-ti-yi,” “firelight place.” A former method of hunting deer at night involved setting fires and driving the animals into the river, where they might be more easily killed by arrows or spears. Somehow, this method just does not jibe with my own upbringing; taking a deer was a much more personal and respectful thing where I grew up. QUANASSEE PATH: This educational and historical pathway in Clay County, N.C., dedicated in March 2014, is named for the old Cherokee town of Tlanusiyi. That settlement, transliterated as Quanassee, was located where the Valley River flows into the Hiwassee River, in Cherokee County, N.C. The city of Murphy now occupies that junction. The name comes from the word “tla-nu-si,” “leech,” plus the locative -“yi.” Here is the legend that explains the meaning, taken directly from Mooney’s Myths of the Cherokee. “Just above the junction is a deep hole in Valley river, and above it is a ledge of rock running across the stream, over which people used to go as on a bridge. On the south side the trail ascended a high bank, from which they could look down into the water. One day some men going along the trail saw a great red object, full as large as a house, lying on the rock ledge in the middle of the stream below them. As they stood wondering what it could be they saw it unroll–and then they knew it was alive–and stretch itself out along the rock until it looked like a great leech with red and white stripes along its body. It rolled up into a ball and again stretched out at full length, and at last crawled down the rock and was out of sight in the deep water. The water began to boil and foam, and a great column of white spray was thrown high in the air and came down like a waterspout upon the very spot where the men had been standing, and would have swept them all into the water but that they saw it in time and ran from the place. On my legs for garters. But before he was half way across the water began to boil into white foam and a great wave rose and swept over the rock and carried him down, and he was never seen again. This entry was tagged Aquoke, Asgina, Asginayi, Asgini, Cherokee word for demon, Cherokee word for devil, Cherokee word for ghost, Chestatee, Cohutta, Copperhead, Doublehead, Ducktown, Fightingtown, Frogtown, Gawonvyi, Hemp Top, Hemptown, Hiawassee, Hiwassee, Holly Creek, Kawanunyi, Kawonunyi, Kawonvyi, Ocoee, Oose tus te, Rana clamitans, Rana clamitans melanota, Skeenah, Skeinah, Wodige asgoli, Yahoola. Bookmark the permalink.